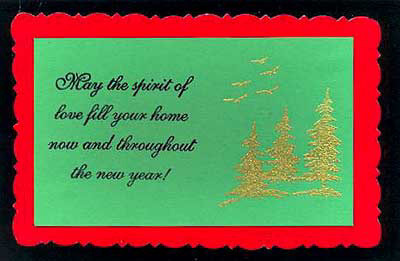 On green card stock, “May the spirit…” was embossed in black. “Distant Birds” and “Pine Silhouette” were embossed in gold sparkle. Pine Silhouette was stamped three times. Glossy red card stock was trimmed with decorative scissors and layered behind the green card stock. The final layer was black glossy. Card by Lynn Lane. “Holly Frame”, was embossed in green on white card stock and red glitter was applied to the holly berries. 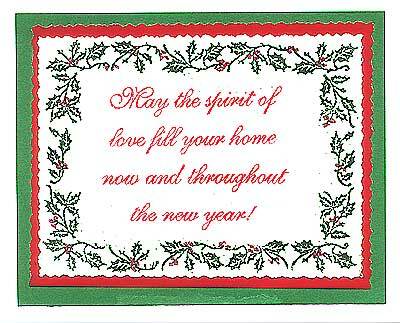 “May the Spirit…” was stamped with a red Marvy pad and the card was deckle cut. It was layered on a deckle cut red glossy card stock and layered two more times, once on green and once on white. Card by Margaret Wiggin.